The U.S. has the highest incarceration rate in the world. We detain more people than any other country, and at a higher percentage of the total population. The epidemic is a fairly recent one, with huge numbers of people being sent to prison and jail beginning in the early 1980s, which, not coincidentally, coincided with the War on Drugs. The problem is still going on, as more Americans are being locked up these days than ever before, despite crime being at a low. But what is behind all of it? If crime is not the issue, why are 6.9 million Americans (nearly three percent of the adult population) under the supervision of correctional systems, according to the Bureau of Justice Statistics? There is a lot of money to be made by private industry when it comes to the criminal justice system here in the U.S. and the War on Drugs. Arms companies make billions by militarizing U.S. police with military-grade gear, as well as supplying mass amounts of weapons to drug cartels, Mexican, South American, and Central American police and military. One of the largest benefactors to locking up mass numbers of Americans is the industry of for-profit prisons. 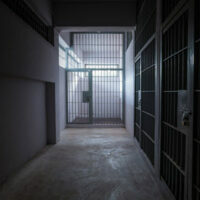 Seven percent of state prisoners and 18 percent of federal prisoners are currently locked up in for-profit prisons, according to the American Civil Liberties Union. These for-profit prisons often have atrocious conditions by cutting corners to turn a profit. Additionally, private prisons detain 75 percent of federal immigration detainees, as well as currently unknown numbers of people in Texas, Louisiana, and other state jails. Proponents of for-profit prisons argue that the government and taxpayers save money by outsourcing prisons to private firms, though there is little evidence to support this claim, as well as counter evidence that proves that it ends up costing taxpayers more. On August 18th, of 2016, the Department of Justice (DOJ) made an announcement that it would begin to phase out the use of private prisons, according to Consumer Affairs. The stock of two of the largest for-profit prison companies, GEO Group and Corrections Corporation of America, fell by 40 percent following the announcement. Just one day after the DOJ announcement, GEO Group donated $225,000 to a Trump Super Pac. With the help of for-profit prison campaign finance, Trump won the presidency. Since November 8th, GEO Group stock rose 70 percent. With federal plans to begin detaining large numbers of immigrants, the for-profit prison industry will undoubtedly see unprecedented earnings, and investors are already betting on this to happen. No matter the crime, whether you were pulled over for a DUI, or arrested for assault or drug possession, do not hesitate to call an experienced criminal defense attorney at Skier Law Firm today at 561-820-1508. Our West Palm Beach legal team is prepared to assist you today.